19-year-old Italian Driver Lorenzo Travisanutto already has a long career behind him. Noted for a long time for his speed, he has been at the top for two seasons as a professional with Dino Chiesa’s KR Motorsport team. 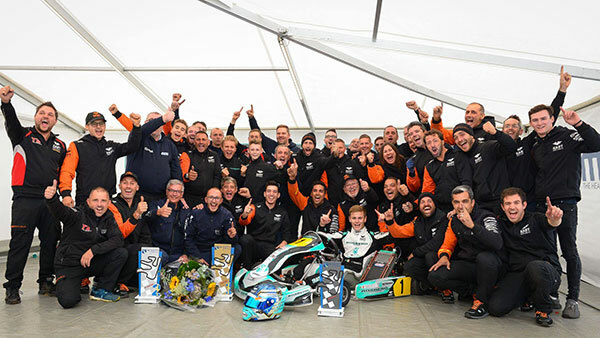 Delayed thus far by many setbacks, in Sweden he was finally able to win the 2018 FIA Karting World Championship – OK indisputably. This year he races under the colours of Rosberg Racing. I started Karting at the age of four. My father did not race himself, but he always imagined that I would be a Driver. He passed on his passion for racing and strongly encouraged me. He was in charge of the mechanics and logistics to reduce expenses because we did not have significant resources. We started racing in Slovenia and Croatia, with a car and caravan, because the minimum age required was lower than in Italy! I was able to start racing in my country in 2007 in 60 Baby. WHAT WERE THE NEXT IMPORTANT STEPS IN YOUR CAREER? The budget has always been the main concern when participating in races with my father. In 2014 with the PCR factory was the first time that I raced with a team. Thanks to this experience, that continued within Ward Racing, I learned a lot, I gained confidence and my career began to take off. A big step forward was made in 2017 when I met Dino Chiesa. WHAT IS YOUR CURRENT POSITION AT KR MOTORSPORT? I am now a professional. I work with Dino Chiesa on the development of Kart Republic equipment. I have great pride in seeing all the Drivers that succeed with our chassis because I know I had a little to do with it. I do not know if I will ever have the opportunity to try my luck in cars, but I am very happy with what I am currently experiencing in Karting, it is an exciting discipline that I love, especially in my current situation with someone like Dino Chiesa and under the colours of Nico Rosberg. HOW DID THE WORLD CHAMPIONSHIP TAKE PLACE IN SWEDEN? After all the troubles I encountered last year and even this year in the European Championship, everything went well this time at Kristianstad. I was on the right pace in Qualifying Practice, I achieved the fastest time and I won my duel with Hannes Janker during the Qualifying Heats. He is a great Driver, very fast, we know each other well and have a lot of respect for each other. We use the same equipment, but in different teams. I took the lead of the Final, but he took 1st place after ten laps. I did not worry because I knew the race was long. I waited patiently for my opportunity, keeping an eye on our pursuers and especially sparing my tyres. After fine tuning my strategy, I came back to him, I attacked him two laps from the finish and I won. I think I deserved the title of World Champion. This is a very important victory that I have been hoping for a long time. I dedicate this success to my father who did so much for me and to my mother for allowing me to follow my path.